Look at you. You did it! All five million of you. You saw that you needed a plan for your money, and you started the best plan: budgeting with the app that makes all the difference—EveryDollar. We just hit five million budgeters, and we think you deserve a party. Did you see that? We threw confetti, put on this party hat, and hung streamers! (It’s not a party without streamers, right?) This blog party’s for you, about you, and even by you (with quotes a plenty). Why Do EveryDollar Users Budget? As an EveryDollar budgeter, you budget because you’ve got big, serious goals. You’re in the engineer’s seat of your own money train. You think you can—and you’re right. So what are those goals? Take a look! “To be mortgage free so we can travel and enjoy life more.” — Renee S.
“To one day buy our own mountain property with no financial struggle or worry.” — Cristal O. “Retire with dignity.” — Mary A. “Because I want to thrive, not just survive.” — Trish K.
Dreams like that—rooted in a plan of action—don’t stay dreams long. They become reality. A budget is that plan of action, and actively using EveryDollar is one of the best ways to move your dream to your reality. Why Do Budgeters Choose EveryDollar? “It works!” — Nicole M.
“When we made our first budget it took us like four hours. But now using the EveryDollar app, we’re done in like 10 minutes!” — Ariel V.
“I like that EveryDollar is easy to use and doesn’t take hours to set up a budget and track spending. It’s simple!” — Tawana B. “SO EASY TO USE.” — Emily H.
“There was a point when my wife and I were using credit cards a lot and were afraid to look at the balance. Since we’ve started budgeting and using EveryDollar, I find confidence in seeing where we came from and where we are going. Thanks, EveryDollar!” — Daryl C.
“Convenient and easy.” — Jazmin S.
EveryDollar is convenient, saves time, provides accountability, and changes how you relate to your money. The word numbers can sometimes cause you to glaze over and stop paying attention, but don’t do that! These stats are far from boring: They show us more about who and where you are. 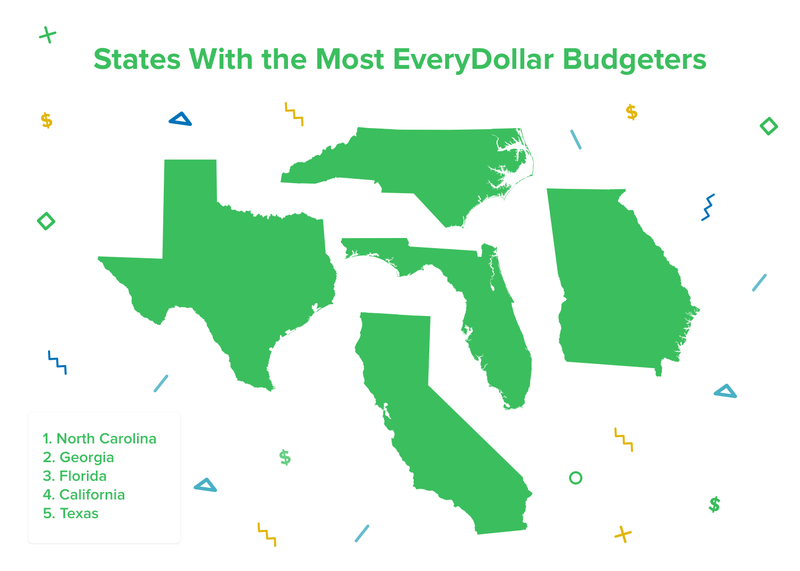 First of all, we’ve got EveryDollar enthusiasts budgeting all over the nation and beyond—Puerto Rico, Guam, Northern Mariana Islands, American Samoa! Next, we’ve got both Android and iPhone users—as well as those who prefer logging in on their desktop. Wherever you are—whatever device you’re using—we think you’re the best. We mean it. We’re on your side and always rooting for you! Look at this! The amount of budgets you’ve made is staggering! The reason that’s exciting isn’t just the sheer magnitude of these numbers—it’s because of what they symbolize. Remember those goals? These numbers say you’re working them—you’re attaining them! Budgets aren’t restraints; they’re roads. A budget looks ahead and moves you forward. You plan on how you’re going to spend your money, and then you move. And you’re ready. You’re ready for change—for turning ambitions into actions, and actions into actualities! “ACT! A plan is nothing without execution.” — Barry P.
“Stay strong! It’s amazing how much your life will change for the better.” — Lisa A. We got a chance to talk to Tara from Indiana—our five millionth budgeter! This assistant preschool teacher was facing down a pile of bills and working to settle into a new family dynamic of living with her mom and son. Tara had a copy of Dave Ramsey’s Total Money Makeover for several years but just recently cracked the spine, which led her to daveramsey.com, which led her to EveryDollar. Looking to tackle the Baby Steps Dave explains in his books, Tara felt EveryDollar could help her get there. “We didn’t know where our money was going,” Tara explains. “It was awful.” She’s dabbled in the budgeting field before, but never seriously or steadily. Now, Tara knows things need to change. As she’s jumping in to EveryDollar, her goals are to get bills caught up, and then to establish good savings for emergencies and for her son’s future. Most of you have pieces of Tara’s story woven into your own. Maybe you aren’t a single mom. Maybe you’ve never heard of Dave Ramsey. Maybe your reason to start budgeting is way different. But we all have goals and plenty of challenges trying to stand in our way. That’s why one of EveryDollar’s goals is to help you kick some of those challenges in the teeth. And we know you can do it—one monthly budget at a time. What Advice Do Our Budgeters Give Other Budgeters? “Looking at [your budget] and tracking frequently can help you hold yourself accountable and remind you that your budget is a priority.” — Melissa S.
“You might hit a few bumps in the road, and it might take a few months of adjusting, but hang in there and make your budget work for you.” — Mary W.
“Give yourself at least three months to get the hang of things—it took us nearly six! If you can, allot spending money, even if it’s just $10. You need TLC too!” — Rachel B. “It took me about two months for everything to get organized, figure out my average spending habits, and then put it into action . . . don’t get overwhelmed in the beginning.” — Lucas S.
Everyone’s different, and your budgeting experiences will vary, but the quotes given above hold solid advice for all. When you start budgeting: Keep interacting and adjusting; don’t give up if you mess up; and expect to take some time to truly get into the rhythm of this new routine. It may take two months, four months, six months . . .but you’ll get there. You’ll be a budgeting boss. If you need us, we’re here! As you struggle—and as you win—you aren’t alone. You’ve got your fellow budgeters and your EveryDollar team to help you sharpen those spending and saving skills. Here’s to you, five million budgeters! And here’s to five million more.